WELCOME...My name is Kenny and I live in Ireland. 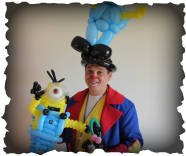 I have been a children's entertainer in the UK and Ireland for several years. 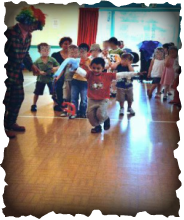 I specifically chose to entertain as a clown or a clown type character as I feel clowns can bring a smile to anybody's face, young or old! I structure my parties to the specific age of the children. From my experience I have found that children like to be the star of the show and I like to incorporate this into all of my shows. Creating a fantastic and magical time gives me great satisfaction and I hope to continue creating wonderful parties for many years. Please feel free to browse the other sections and if the information you need isn't there, please email or phone me and I will do my best to help answer any of your queries. I have a fully Enhanced Police Check (CRB) , plus fully Garda vetted and I am also a member of equity.